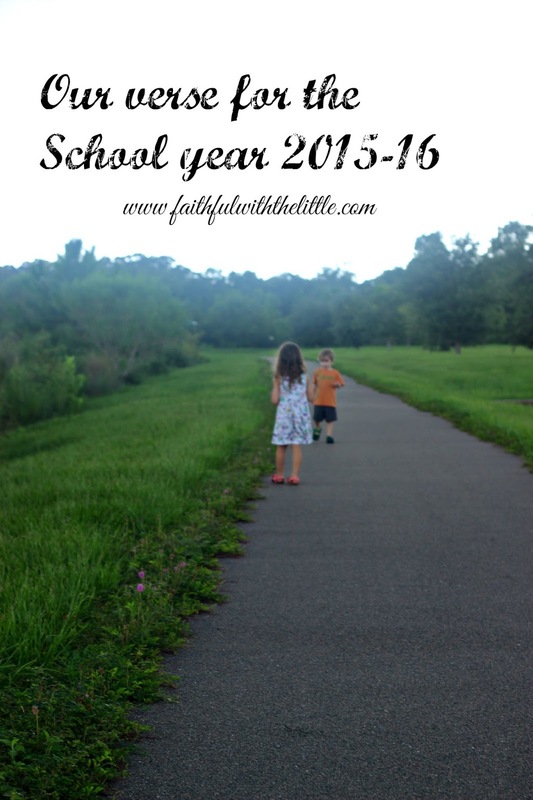 All over the web I have been seeing homeschool mamas share their verse or theme for the year. I honestly hadn't really given much thought to what our theme should be this year. I was too busy trying not to freak out and wonder how I am going to homeschool a 5th grader, 3rd grader and Kindergartener; while keeping my toddler and 3 year old from destroying the house! But as I have been praying and asking God to give me grace and strength this year as we head into the scholastic world; a verse popped in my head. I knew this was my heart and God's heart for our family...for our little school at home. A big part of my fears and worries in homeschooling is my kids not being where they should be academically. That I won't being able to teach them everything they need to know. I also tend to want to rush them through the day so we can just be done. Sometimes things don't always go as I've planned. The lessons I've taught don't always click right away and my little pupils don't always get everything. I don't always respond the right way. The refreshing truth is...is that it is okay. There is no rush. We are not in a race. Children and adults all learn at their own pace. So many times I have pushed my children when they weren't excelling in an area, only making them frustrated and feel worse about themselves. The times I have given them space and encouraged and spurred them on when they were ready; is when they have excelled far beyond what I could have imagined. God is doing a work in all of us. He is the teacher; we are the students. He is the best possible teacher I could imagine. He is patient with us when we don't understand, yet loving and stern when we need correction and discipline. He has our best intentions in mind. He knows exactly what our learning style is and how to implement it in our lives. He sees the end result and knows how we will all turn out. He is making everything beautiful...in it's time. For this I am thankful. Have you thought about what your verse or theme for the year is? I like your theme verse for the year! He does have such patience and such perfect timing! I really like this line, "He sees the end result and knows how we will all turn out." My kids are in college now, and they are doing well. Although we didn't do everything perfect all of the time, they have done so well. And, we made it with a sweet relationship still in tact! Sounds like you are a great mom. I pray you and your kids will have a fabulous school year - taking one moment at a time. Came over on Mama Moments. Glad to find your post. I love how you picked a them verse for the year, and it's a great one! I need to think on a verse for our tot school year! 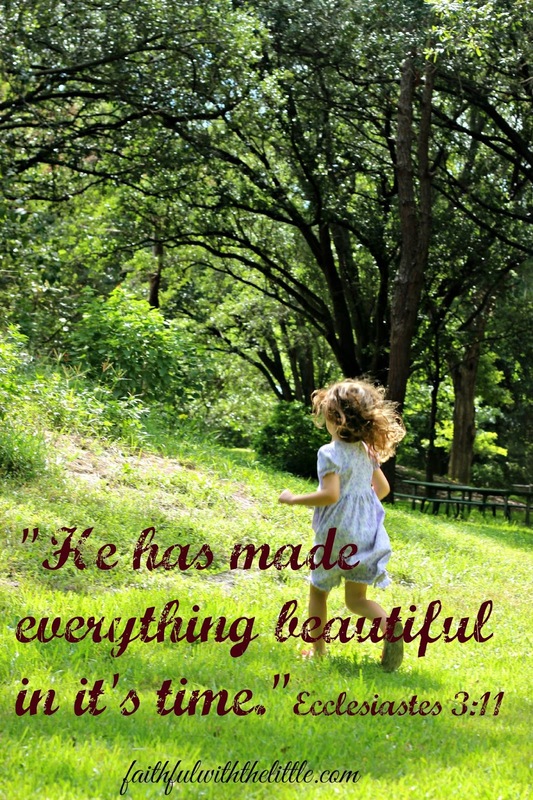 Thanks for your encouraging words and for linking up! Thanks Moriah! I am so thankful God put it on my heart! Hi, Rebekah! I love that verse and the thought behind it. Now I'll be praying about a verse, too. Thanks for sharing! Oh good! Having a verse has changed my whole outlook for the year! God's word is so powerful! This is lovely and I just adore that you chose a verse for the school year! You've totally inspired me to do the same. Thanks Jennifer! I am so glad!I have never done this before and I can already see how it is having a positive impact on our year!